Wash days would not be so bad if the detangling was not a part of it. Heck, life wouldn’t be so bad if detangling wasn’t a part of it. All kidding aside, detangling whether hated or loved is essential in any curly hair care routine. While some have harder times than others, we all know the time-consuming detangling can be despite being necessary and essential to healthy hair care. Detangling can be harsh and counter-productive if not done correctly, so finding sound ways to do it and successfully often takes more than just skill. It takes a tool. A detangling brush is just like it sounds. A brush created to detangle your strands. While many opt for finger detangling (me included) it is a tedious task that some find too time-consuming especially if you are blessed with lots of tangles. Detangling brushes actually lessen detangling sessions but know that you need the right brush (that depends on your needs, hair and price level) and the correct tips to make sure that brush and your hair become friends. Here are some tips on making your detangling brush an ally in your detangling sessions and to reduce as much breakage as possible when using one. 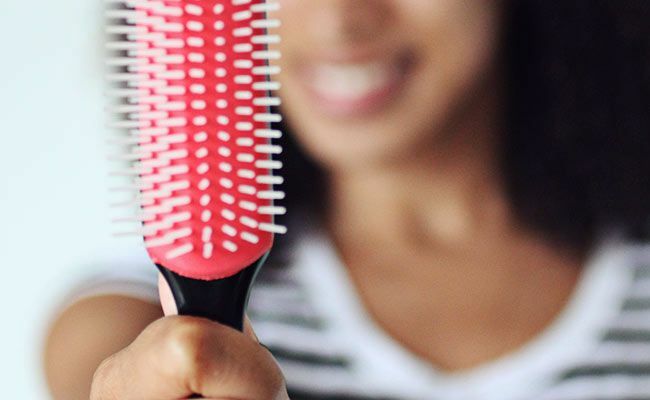 Yes, the right brush is solving half the problem of detangling. Just as there are different products for hair types or conditions, there are specific brushes that work better for certain types of curls, waves, and coils. From flexible bristles to comfortable handles, using the right brush that gives you an advantage to brushing effectively and gently is the best way to damage less and detangle quicker. I prefer the horse hair brush, similar to the Felicia Leatherwood brush, as it has flexible and unattached comb rows that allow my hair to glide through easier than other brushes. When I did detangle with a brush, it is the only one I use, but what may be ideal for me is not the case for everyone. Popular ones are the Tangle Teezer, the Denman brush, or even the Michel Mercier Ultimate Detangling Brush. No one says the brush needs to do all the work by itself. There are reasons many opt for using oils, conditioners, or detangling products to aid in adding slip and removing the tangles easily. Products give the hair slip and reduce friction for the brush, allowing for less damage and more effortless follow-through. This is actually ideal for any detangling method, as working with sections allow for less challenges. Brushing your hair, especially long and dense hair, without sectioning makes for missing tangles. Working in smaller sections, like 4-8, gives better control of the brush and hair. Sounds like a lot of work? Well, you will be surprised how effective brush detangling becomes once you have finger detangled first. This allows for you to feel out the big tangles and knots prior to trying to yank through them with a brush. Finding the big ones prior with your fingers and loosening them allows for less damage from the brush if it comes across a big tangle. Never start from the roots when detangling. Always start from the bottom and work your way up the hair shaft to minimize breakage. Work your way up inch by inch until the entire section is detangled. Our hair loves to curl around itself. Detangling should never be rushed and it most certainly should not be done when you are short on time. I just wait an extra day if too tired or if have little time to do it correctly. Moving too fast leads to ripping and breakage. Take your time and relax.